How is it possible to answer a closed question without asking for it to be reopened? This question was closed by a prominent contributor with 87 gold badges including the boxes badge (which tags this question) at 4:48 pm. Another prominent contributor with 9 gold badges himself, but not the boxes badge, responded at 5:44 p. m., almost an hour later. I thought that no one could answer a closed question and I realize that no: some contributors have unsuspected privileges. What is the privilege of responding to a closed question without having to reopen it? According to How was this answer posted after this question was closed? (found by Joseph Wright in the comments) the server accepts answers to closed questions for a grace period of up to four hours after they were closed. If one starts writing an answer before the question is closed or just has the question opened in a tab in un-closed state one can just still submit an answer. 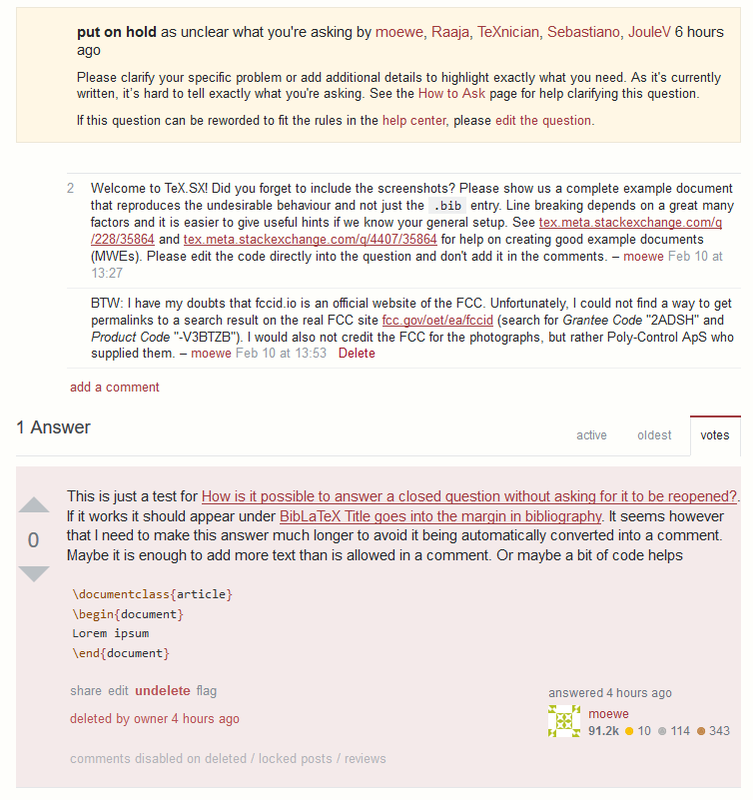 It is even possible to submit an answer to a now closed question if one does not have access to an un-closed version of the question. The method is described in How was this answer posted after this question was closed? and works by manipulating the HTML code of an open question to submit to the now closed one. I verified that that indeed works with BibLaTeX Title goes into the margin in bibliography. 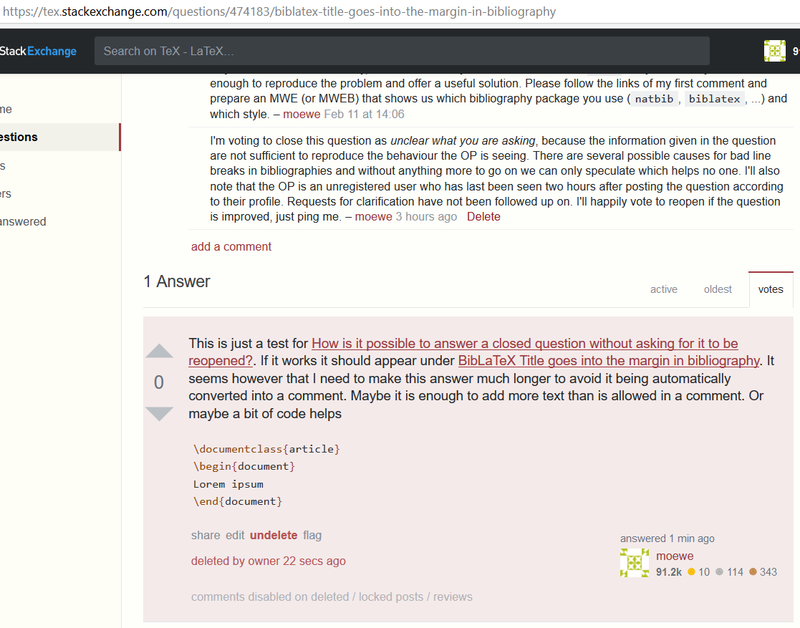 I managed to submit another answer (which I immediately deleted) some two hours after it was closed. Now you might ask whether I might have a secret privilege that allowed me to do that. If you want to absolutely make sure that that is not the case you (or you as unregistered user) can try and submit an answer to (solved) mdframed - different skip heights after page break in the next 45 minutes or so. I didn't bother to do that because I have already posted enough (fake) answers today to annoy the community. Does it really take 15 rep to upvote an answer to your own question? Is it possible to give away the golden hammer “privilege”?